How is the Fish and Wildlife Service handling the coming wave of extinctions? By asking Congress to make a law limiting how much they can spend figuring out if species need protection. The point is to use it as an excuse the next time they get sued. The New York Times had a great story about this bizarre budget request. Can you imagine if your local fire department only got out to 12% of your city’s fires and instead of asking for enough funds to handle the blazes asked the fire chief asked the mayor to legally limit how many fires he could be called out on? You would think the chief wasn’t too serious about fighting fires. And that’s pretty much what people think about Interior Secretary Ken Salazar: he’s just not all that interested in the interior and seems hostile to wildlife. The FWS is sittng on petitions to list 254 species. Yes, they are getting slammed by lawsuits petitioning to list species. But if those petitions were frivolous, they’d be able to weed them out in the first round, 30 days. So far the Obama administration has only given 59 species protection–a record about tied with George Bush, Mother Jones pointed out recently. And if you exclude a group of 48 on Hawaii that Bush had set in motion, his record is much worse: 11 or just 5.5 per year. Bill Clinton averaged 65 a year and the second Bush at least did eight a year. At the current rate, the Fish and Wildlife Service would take nearly 50 years to plow through just the petitions already filed. 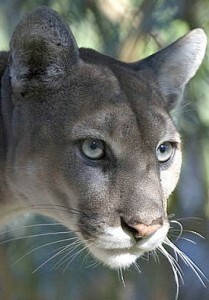 The Fish and Wildlife Service met the one-year deadline in only 12% of the findings in 2010. They’re shooting for a stunning 4% this year and next year they don’t plan to finish any, according to their justification for the ESA program for 2012 (page ES-7). For critical habitat rules, they’re hoping to move from what would currently be an F grade (57%) in school up to a D (69%). But then for 2012, it’s like they plan on cutting class a lot and only getting a 19%. Interior Secretary Ken Salazar is asking Congress for “an appropriations language funding sub-cap for petitions.” The request whines: “The many requests for species petitions has inundated the Listing Program’s domestic species listing capabilities, impeding expeditious progress on listing Candidate species.” How much time does it take to ignore requests to list endangered species? The entire Endangered Species budget is only $182 million, 1,100 workers and and just $25 million of that is for working on listing decisions, up only $2 million. The ESA budget has barely budged: in 2008 it was $150 million and 1,024 were working on it. ESA Consultations for Renewable Energy Projects. They don’t specifically say how much this costs, but they want $2 million more. This is where if you own a windfarm, you ask when you should turn off your blades. Hey, alternative energy is great, but can’t these companies pay an environmental consultant instead of getting government advice for free? Or better yet, couldn’t the agency come up with overall guidelines? Fisheries and Aquatic Resource $136 million. Some of this is real conservation, but a lot of it is spending money on docks to promote recreational boating. They plan to spend $42 million on fish hatcheries–mainly growing fish for people to catch, though a small percent is making up for federal water projects. 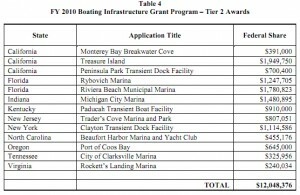 State sport fishing grants: $372 million under the Dingell-Johnson Act. This steers taxes on things fishermen use to promote boating. But it’s been amended many times and might be better spent on overall conservation instead of docks for yachts. For instance, in one of those lawsuits petitioning the USFWS, the Center for Biological Diversity asked for protection for 403 species in the freshwater of the southeast. “Unfortunately, the Southeast’s rivers are the extinction capital of North America,” Noah Greenwald, endangered species program director at the Center, said in a press release. The suit says “extinction is looming” for 28% of the region’s fishes, 48% of its crayfishes and 70% of its mussels. The Center wants protection for 48 fish, 92 mussels and snails, 92 crayfish and other crustaceans, 82 plants, 13 reptiles (including five map turtles), four mammals, 15 amphibians, 55 insects and three birds. At minimum, I bet the recreational fishermen and boaters care about the 48 fish species (a lot of darters, shiners, shad and catfish) –and if they’re advanced sportsmen they’re somewhat interested in the whole ecosystem. 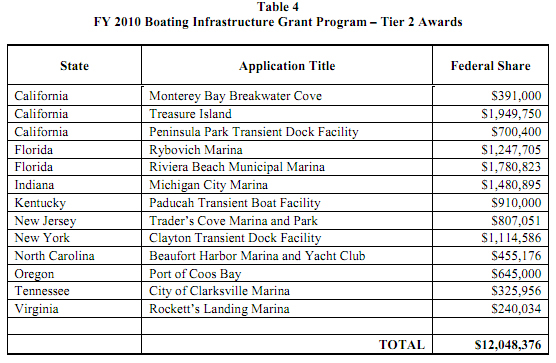 $15 million on infrastructure of boating facilities, which includes money to “construct, renovate, and maintain tie-up facilities with features for transient boaters in vessels 26 feet or more in length.” Here transient means the opposite of poor; these are big yachts and sailboats. In the USFWS’ version of the bridge to nowhere, my own state of New York got $1.1 million to build a “transient dock” in Clayton, NY. Clayton, which has less than 5,000 people, is trying one of those urban renewal operations that inevitably includes a riverwalk. Terrific for Clayton; I wish could visit the cute town. But it’s perched on the St. Lawrence, about as far as you can get from population and highways. The dock’s not for the town, it’s for boaters you say? Yeah, but there’s another one 20 miles away and other slips at a nearby state park and across the river in Canada. Meanwhile, they pulled $500,000 in funding for whooping cranes.